The Herbalizer vaporizer is back and better than ever! In addition to providing both balloon bag and whip-draw inhalation methods, the Herbalizer now gives you the option to direct draw through the Herbalizer Glass Steamroller attachment for smoother, tastier vapor (sold separately). Some call it a split personality, we call it versatility. 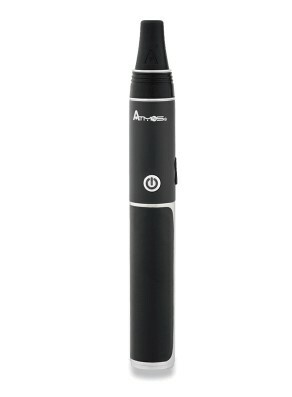 The Herbalizer vaporizer lets you experience the benefits of essential oils and herbal remedies in classic aromatherapy or vaportherapy modes. What’s more, you can vape at temperatures up to 445 degrees with absolutely no risk of combustion or incineration. 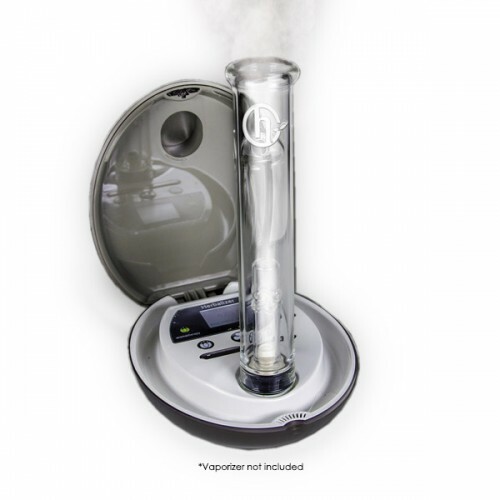 This is totally unheard of in the realm of botanical vaporization and San Diego-based Herbalizer is proud to deliver unprecedented vapor versatility in an ergonomic and professional medical device that is designed and assembled here in the USA. Add a hidden storage compartment, an internal halogen bulb to provide instant heating, and four distinct delivery methods, and well, don’t you just love options? The Herbalizer’s easy-squeeze valve balloon system is simplicity defined. 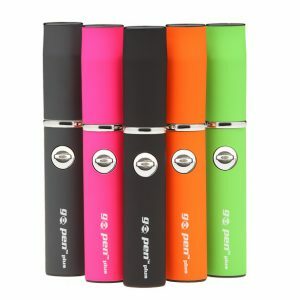 Squeeze, attach, and fill with pure, flavorful vapor using the internal fan. Herbalizer recommends that you replace your balloon bag after every 2 months of continual use. 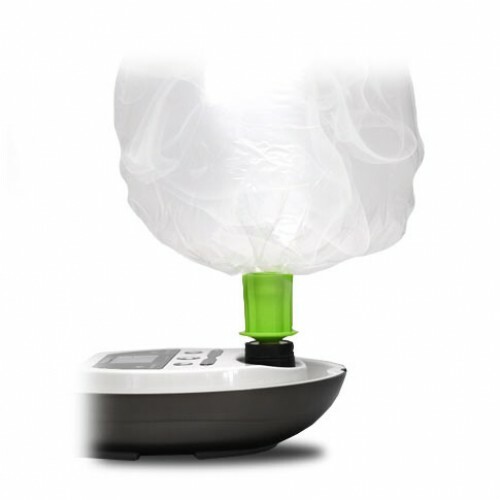 There are three additional bags included in every Herbalizer Vaporizer starter kit. Convenient and uncomplicated, the Herbalizer’s integrated, medical-grade silicon whip gets an optional boost from a powerful, whisper quiet fan. You may be asking yourself what does “integrated” mean? Simply that the whip is built into (a.k.a. “integrated with”) the Herbalizer housing unit using an ergonomic trench that surrounds the heating chamber and houses the whip, keeping it safe and out of the way when not in use. The new Glass Steamroller attachment is the latest innovation from Herbalizer. Using the steamroller provides an all-glass airway for vapor to travel through upon inhalation, which allows you to experience the true taste of your vapor. Since glass is a completely inert material, the vapor produced doesn’t pick up any residual taste along the way, resulting in ultra-clean, ultra-pure vapor. If you thought enjoying vapor using the Herbie’s squeeze valve balloon bags or integrated whip system couldn’t get any better, then just wait until you try the Herbalizer vaporizer with the new steamroller attachment! Freestyle means you are emitting pure vapor from the Herbalizer’s bowl directly into your environment – no muss, no fuss. 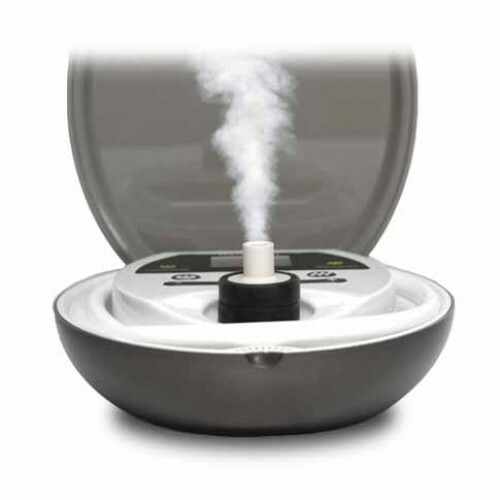 This setting is ideal for practitioners of yoga, massage, reiki, or meditation as it adds a potpourri effect, but freestyle vaportherapy and aromatherapy provide more than just a pleasant smell; essential oils or botanicals diffused through the Herbalizer provide noticeable holistic benefits. Intelligently designed, the Herbalizer features a sleek, luxurious aesthetic and clam-shell housing unit which opens to reveal an intuitive, easy-to-use interface. 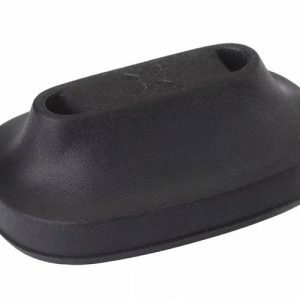 The heating chamber itself features a magnetic snap-lid, another first in the vaporizer industry, something that vapor connoisseurs have been craving for years. Developed with safety, sophistication and satisfaction in mind, the Herbalizer team spent 4 years in research and development; their team, spearheaded by two NASA engineers, surveyed the vape landscape to fine-tune and integrate all of the best existing methods with embellishments and improvements from the vaping community into a device that addresses all of the aspects of a superlative home vape experience. For additional personality and panache, the Herbalizer designers customized a range of friendly greeting messages that welcome you during the boot-up process. The entire experience is engineered with user happiness and health in mind. Even the tiny details like a “talking” temperature screen speak to the company’s mission of providing flawless performance for the discerning patient and consumer. Bottom Line: The Herbalizer is the result of NASA minds putting their synapses to work with the input of vape experts and critics from around the world. The result? The Herbalizer is one smart cookie. No confusing assembly required. No extraneous accessories. No material left out in the cold. But the best part is: there’s no waiting to vape! The Herbalizer introduces vaportherapy. The natural evolution of aromatherapy, vaportherapy is the process of volatizing plant material for the purpose of therapeutic relaxation. 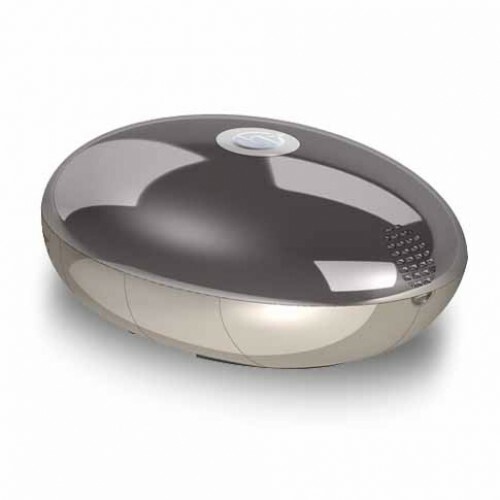 The Herbalizer lets you control the intensity of your experience with accurate heat settings, from 290 – 445°F. 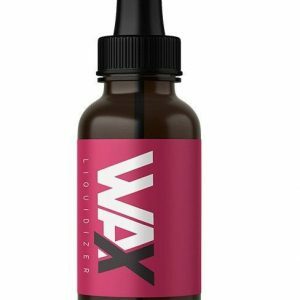 Customize the benefits of your favorite herbs, oils, and concentrates through precise extractions and repeatable effects. From relaxation to rejuvenation, create your ideal environment in the Herbalizer’s aromatherapy mode. Set the timer to a few minutes—or an hour, then set the fan to Quiet and enjoy the aromatic benefits of your favorite essential oils.Need to deodorize? Try the Herbalizer’sDeFunk blend of essential oil (included with purchase) specifically formulated to “get the funk” out. The Herbie is the most versatile vaporizer ever created. Who knew the mysterious oyster would yield the sublime pearl? Stow your flowers, oils, waxes and aromatherapy blends discreetly out of sight in the Herbalizer’s mezzanine storage area located in the upper lid. This is another first for VaporNation. Nowhere in the vaporizer pantheon, have we seen a system that is so self-sufficient, providing internal storage for all the necessary pieces. The hallmark of the Herbalizer is its ease of use – this is no more apparent than with the bright digital LCD touch screen. Using this colorful display, patients can quickly and easily dial in their preferred temperature for either aromatherapy or vaportherapy mode. Typically this feature is most relevant to the vaportherapy mode, but it is essential to know exactly what temperature your herbs are heating at no matter what means of ingestion you choose. The display can be customized to read in Fahrenheit or Celsius and features an intuitive temperature dial, which is regulated by an internal microprocessor, which also monitors the temperature of the 300W halogen lamp. When you fire up the Herbie, the internal microprocessor will store the previous temperature setting for fast usage and easy aromatherapy enjoyment. What’s great about this feature is that you can dial in an exact temperature level between 290 and 445 degrees Fahrenheit. From 290 to 330 degrees Fahrenheit is the “Uplifting” zone, meaning that the volatized flowers provide an alert, uplifting and awakened experience.Moving up to the 350-445 zone is the “Intense” zone which produces dense, heavy vapor which delivers a more impactful euphoria with slightly longer-lasting effects. The Herbalizer is also equipped with instantly intuitive fail-safe systems powered by the internal computer. One of these fail-safes is the Over Temperature Shutoff which means the internal microprocessor will astutely regulate the lamp temperature and make incremental adjustments within hundredths of a second of any deviation from the selected temperature level. The other exceptional fail-safe which is unique to the Herbie is the Tip Over Auto-Shutoff, which can sense when the equilibrium of the vaporizer has been agitated. That means if you, your pet, or your over-enthusiastic friend accidentally knocks over the Herbalizer, have no fear. The Herbie will shut down immediately, remember your selected temperature, and since there’s a magnetic seal on the heating chamber, none of your materials will be wasted! Dimensions: 7 x 10.5 x 11.25 in.